Summary: California and Quebec’s tenth joint auction failed to clear for the fifth consecutive time. 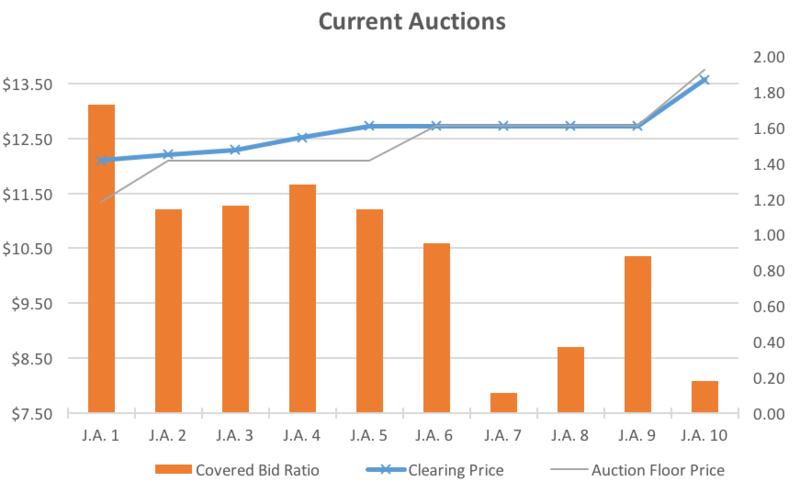 The bid-to-cover ratio was observed at 0.18 for the current auction, the second lowest ever behind last year’s May 16 Auction. 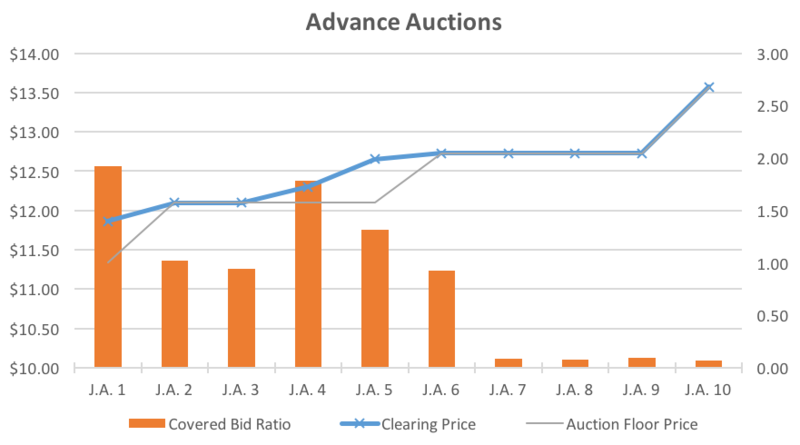 The Advance Auction which offered 2020 vintage allowances also fell well short of a full subscription recording a 0.07 bid ratio. 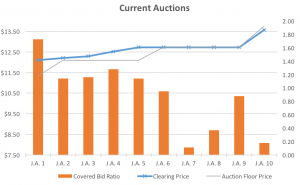 Both auctions consequently settled at this year’s auction reserve price of $13.57. In contrast to the ninth Joint Auction which saw high volumes of allowances cleared, only 11,673,000 CCAs were purchased. 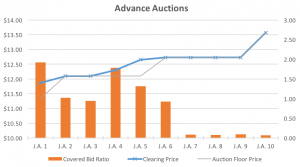 Unusually the most dramatic response on the secondary market was felt yesterday, the day prior to the auction results being released. 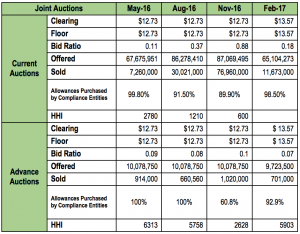 On news from the office of Senate President, Kevin de León, that the auction had once again failed to clear, CCA prices tumbled with the broker’s spot delivery clearing at $13.47 – down $0.09 on the the previous day. Spot prices dropped further following the publication of the results reaching $13.45 and $13.57 for the Dec 17 contract today. Although only online for a short period of time, the market showed a sharp response to this leaked press release. With the auction results affirming the Senate President’s hunch as to the outcome of the auction, questions will remain as to whether the announcement was indeed a miss-fired statement, prepared in anticipation or if Government officials were informed of the results before the market. One thing which is for certain is that the pending litigation of the ARB vs CCC auction case continues to cast uncertainty over the long-term perspective of the market. 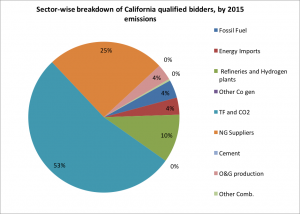 A leading carbon broker alluded to the impact of secondary market volume traded during January and February as to the low participation observed. Although undersubscribed at 80%, 77 million in volume was cleared during November’s auction. In addition, fairly significant volumes have been trading on the secondary market over Jan and Feb this year whilst the price hovered below the floor, affording participants an alternative other for CCA bidding. As pointed our earlier this week in our weekly outlook, a subscription ratio below 20% will trigger a quarterly shortage though momentarily. So as is the case, a general cumulative shortage of allowances has been triggered for the first time in the history of the market, the deficit is projected to be at a level of 2.3 million. 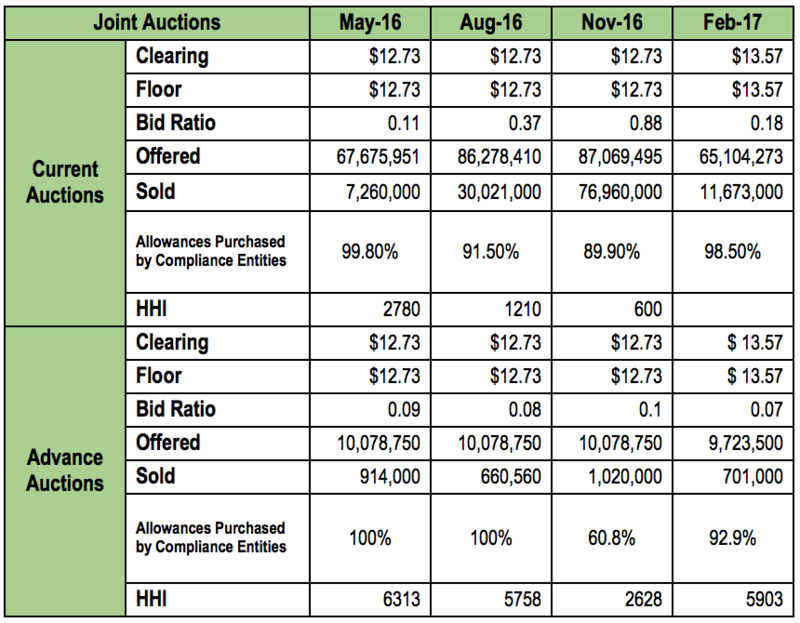 However with two more auctions before for annual surrender and six more auctions before the triennial surrender – the market still has sufficient time to recover in volume before the situation becomes critical for compliance.